A grant, bargain, and sale deed is commonly used in Nevada for a conveyance of real property. There is not a statutory form for this deed, but the Nevada Statutes provide relevant terms and rules of construction. The following covenants are implied by the use of the words "grant, bargain, and sell" in a conveyance by which an estate of inheritance or fee simple is to be passed: (1) Previous to the time of execution of the conveyance, the grantor has not conveyed the same property, or any right, title, or interest, to any person other than the grantee, and (2) that the real property is, at the time of execution of the conveyance, free from encumbrances done, made, or suffered by the grantor, or any person claiming under the grantor (NRS 111.170). If a person purports to convey property and does not at the time of such conveyance have the legal estate in the property but will acquire it afterwards, the legal estate subsequently acquired by the grantor will pass to the grantee (NRS 111.160).This type of deed does not offer the same covenants of warranty as a warranty deed. 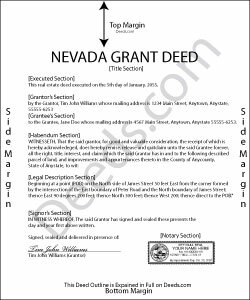 Before a grant, bargain, and sale deed can be recorded as directed by the Nevada Revised Statutes, it must be signed by the person from whom the estate or interest is intended to pass (the grantor), and it must also be acknowledged or proved. For grant, bargain, and sale deeds that are proved or acknowledged within the state of Nevada, the acknowledgment or proof can be taken before a judge or clerk of court having seal, a notary public, or a justice of the peace (NRS 111.265). A certificate of the acknowledgement or proof of execution, signed by the person taking the acknowledgment or proof, and under the seal or stamp of that person, will entitle the deed to be recorded (NRS 111.310). Additionally, a Declaration of Value must accompany a deed that is submitted for recording. In order for a grant, bargain, and sale deed to operate as notice to third parties, it must be acknowledged and certified as prescribed by the Nevada Revised Statutes, and recorded in the office of the county recorder in the county where the property is located. After the grant, bargain, and sale deed has been recorded, subsequent purchasers and mortgagees are deemed to purchase and take with notice (NRS 111.320). If the deed is not recorded, it will be valid and binding between the parties to it (NRS 111.315). A conveyance of real property within this state that has not been recorded is void as against a subsequent purchaser in good faith and for a valuable consideration, of the same real property or portion thereof, whose conveyance is first duly recorded (NRS 111.325).